I dare say you like me, more often than we care to admit to ourselves, or anyone else for that matter, find ourselves faced with the quandary. Where is a sharp knife when you need one? Due to no fault of our own mind you, we have all tried to sharpen a carving knife, before making a mess of the thanksgiving turkey, Christmas ham, lamb or goose. The thing is, after using our kitchen knives for everything from prying apart frozen foods, too opening the mail, and cutting shipping tape used on all those boxes from amazon. That hard to use sharpening steel that came with that last set of knives, just doesn’t get the job done. The good news, there is a much better way to keep all our favorite cutting tools razor sharp. Follow along as we discuss Work Sharp Knife and Tool Sharpener, and join in on the how to sharpen knives scissors and shears chat. 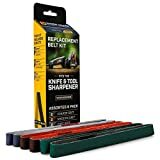 Buy the perfect gift for hunters, anglers, and campers on your list that sharpen their own hunting and fillet knives, ax or hatchet at amazon and get free shipping. Ask any chef, gardener, hunter, and angler about their favorite cutting tool, and there is one simple fact everyone will agree. Regardless the cutting, chopping, and slicing job, using a good sharp knife is extremely important to us all. Where our opinions will differ, what exactly is the best way to sharpen our trusty kitchen knives, hunting knife, and pruning shears? The truth of the matter, many busy folks just as soon pay a professional rather than master the skill, where others still prefer to tackle the task themselves. Using sharpening stones, ceramic sticks, carbide sharpeners, and diamond hones. 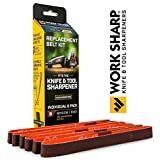 On the other hand, for those of us on the lookout for a better way of sharpening their favorite cutting tools, I want to share with you what I and many of my friends believe is a much better alternative. 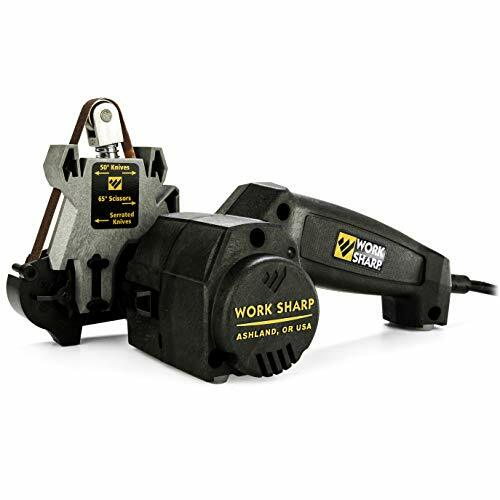 Work Sharp’s WSKTS knife and tool sharpener for the best price available at amazon. Make sharpening dull knives, scissors, shears, shovels, pruners, axes, and hatchets more like fun. Ok let’s face it; there are those among us that are intimidated by any kind of power tool. They make funny noises. Require a certain amount of hand and eye coordination, training and skill. Fear not, the WSKTS makes about as much noise as an electric can opener, and comes with a DVD filled with detailed use and sharpening instructions designed to help the most inexperienced person. Using specially designed flexible abrasive belts, the WSKTS makes sharpening all styles of knives easy. Straight blades like those used on fillet and boning knives, serrated hunting, camping and survival knife blades, other types of cutters and blades like those used in, X-ACTO knives and scalpel blades, commonly used by taxidermist and crafters with a bit of practice are easily sharpened to a razors edge. Engineered to sharpen every style kitchen, hunting, fishing, and utility knife blade you and your friends cherish. 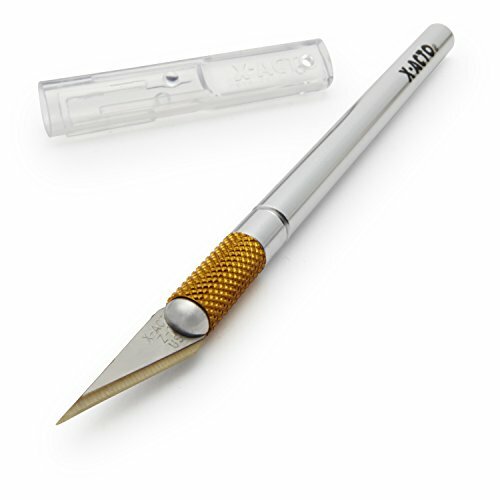 The Work Sharp’s WSKTS uses the same technology professional’s use. Flexible abrasive belts quickly and accurately put a keen razor sharp edge on cutting tools of all kinds. 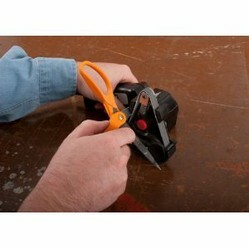 Using the Work Sharp sharpening system you will amaze your friends by taking advantage of this time proven technology. 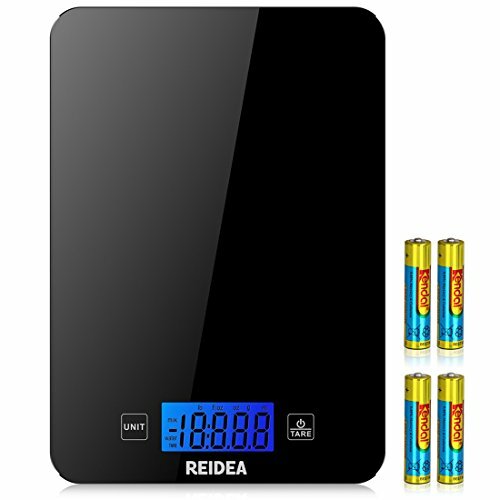 Just imagine how great you will feel, finely having the tool you always wanted to accurately, sharpen all your dull knives. Hunting knives with straight or serrated edges will not be a problem. Finely sharpen a gut hook on that ole faithful skinning knife. Bring back to their formal glory, that drawer full of dull old kitchen knives, pocketknives, survival knives and let us not forget fishing and camping knives. Using the precision sharpening guides make it all doable. 2. A 20-degree guide for putting a perfect edge on your favorite scissors, axes, and hatchets every time, and for the Gardner in us all sharpen your dull lawn-mower blades, and garden tools and save the money you pay to have them professionally sharpened. Treat yourself. 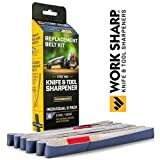 Made in USA, the Work Sharp’s WSKTS sharpening System, measures mere 9-inches by 6-inches by 5-inches, and comes with an instruction manual and easy to understand instructional DVD. 2 each, P80-grit belts works well to reestablish worn, nicked, or damaged blade profiles. 2 each, P220-grit belts works great for touching up and keeping blades sharp. 2 each, 6,000-grit belts hone even hardened-steel edges razor sharp. Compact and powerful, this system operates off any 12-volt system with a power inverter in a vehicle, boat, or RV. @katiem2 remember to sharpen all your garden tools and pruning shears. Making clean cuts when you prune all your shrubs, bushes and roses makes for happy healthier plants. Want the best Bushcraft Backpacking Survival hatchet at an affordable price, read this in-depth review of the Fiskars X 7 hatchet before you buy.